GUADALAJARA: Flash fiction and nonfiction, a genre that brought brevity to our bookshelves by way of literary magazines, has come of age, with Random House Mondarori’s (RHM) launch of its Spanish-language Flash series, a collection of short fiction by renowned authors available only as e-books. The collection is accompanied by its sister non-fiction series, En Debate, showcasing the work of historians and journalists focusing on current affairs. Both series were presented at the Guadalajara International Book Fair in Mexico last Monday. The idea emerged from the publisher’s realization that the e-book represents a unique platform for publishing shorter works whose printing and distribution in paper format would not be commercially viable, together with the emerging importance of the digital platform among readers in the Spanish-speaking world. The move is a break with the traditional marketing strategy of e-book production imitating physical books, or vice versa, with the launch of a series exclusively available as e-books. In the case of the fiction series, Flash will act as a teaser for readers who are perhaps not willing to invest in a full-length book by a writer still unknown to them, while also encouraging readers still not convinced by the digital format to try it out. 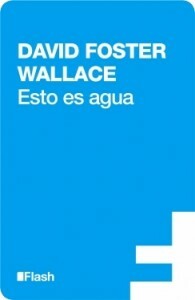 The series launched with a Spanish translation of David Foster Wallace’s This is the Water, an example of how a writer known for his lengthy novels will become more accessible with the publication of a shorter work in Spanish, and which may serve to bring his longer works to a wider audience. The series also includes short fiction by Mónica Lavin, Carlos Pascual, Álvaro Enrigue and Óscar de la Borbolla. The non-fiction En Debate series also answers the need for “instant publishing,” particularly of journalism relating to current events. “The example we cite is the Fukushima tsunami,” RHM’s director of e-books Carmen Ospina says. “With traditional format books, it would be up to a year before we would be able to publish essays or articles relating to a contemporary event, whereas the En Debate series allows us to make works with immediate relevance immediately available,” she says. Also included is Mexican journalist Julio Scherer’s 1994 interview of Mexican Nobel laureate Octavio Paz, carried out in the poet and essayist’s 80th year, and historian Enrique Krauze’s essay on the art of biography. The titles sell for $1.99 in the USA, which remains RHM’s largest market for e-books in Spanish, or for 29 pesos in Mexico, a digital book market that is still in its infancy but is expected to see faster growth than other Latin American countries as more e-bookstores open and a wide selection of e-readers become available.